Bonnie MacDougall of Havenhoopdance, began hooping in 2002 on the Weaver St. Market lawn in Carrboro, NC after an injury left her unable to continue her intensive running regimen. She has never looked back. A weekly student of Jonathan Baxter’s, founder of the HoopPath, for 5 years, Bonnie’s practice is nourished with meditative movement as well as technical hoop artistry. Bonnie taught HoopPath classes in Chapel Hill, NC for over 2 years accumulating a multitude of hours as both a teacher and a student. She has also taught and performed at workshops and shows across the Mid-West, New York City, San Francisco and North Carolina. 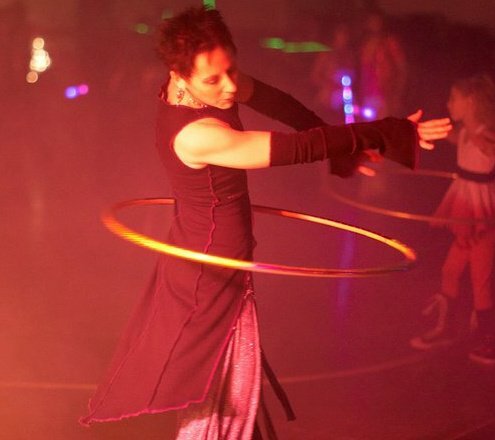 Since relocating to the Detroit Metro Area of Michigan in April of 2011, Bonnie has continued her hoop journey as teacher, student, and performer.